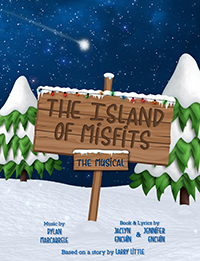 This magical musical tells the story of Grace, who recently graduated college with a degree in astrophysics, and her friend Nikki who through unexpected circumstances are transported to The Island of Misfit Toys. There, the pair help solve the problem of Santa who has gone missing, battle the evil Charlotta, and with the help of the toys, discover that "misfits" can be assets in setting things right. After returning, Grace enlightens us all by expressing the truth that there is always hope (even in the darkest galaxies, there is always light) and that we are truly infinite.